The bonus of competing at Ripon is that the first wave is off at 1pm (normally they are daft o’ clock, when the milkman is dropping off). This allowed me to have a good sleep, relaxed breakfast and even time to prep and pack, this would normally be done the night before. I went over with my coach Rodger and this gave us time to chat and focus on the race ahead and formulate a plan/tactics. With this being a WQ and the English Champs I knew the standard was going to be very high and was looking forward to seeing where I would position in my AG. The weather could not have been better and the event was a real success with plenty going on for spectators and families, a well-run event. I entered transition and found my spot, racked my bike and went through all the various entry and exit points for each of the disciplines. Luckily for me my rack was the first one as you exited the swim so easy to locate. The swim wave was the biggest so far this year I had swam in, probably somewhere between 160-200. However, this makes no difference to me as I am now confident enough and at a level where I stick myself right at the front – clear line of sight to my marker. If people are quicker than me then they have to pass me, that’s my attitude. Straight forward 1 lap route going clockwise, no issues really in the swim other than the usual in the first 300m. Best I have felt in a swim this year, relaxed and in a rhythm. Unfortunately, never really found any feet that were worth sticking on, plus you were always sighting for back markers from the wave in front. 25.47 was my swim time, thought I would have been closer to 25mins flat but that is racing. Into T1 and wetsuit came off like a dream, helmet on but struggled with the clip a couple of times, once clipped I was on my way. The ground was bumpy so I ran steady having had an incident earlier in the year where my bands holding my shoes came off their housing. Mounted the bike over the line and was on my way. The bike was something I was really trying to focus on, thinking about position and the power I was putting through. Constantly feeling if the chain was taught on the teeth of the ring, was there any slack (too easy basically). I put maximum effort into the bike and it was a hot day so made sure I took on my fluids and had 2 gels. 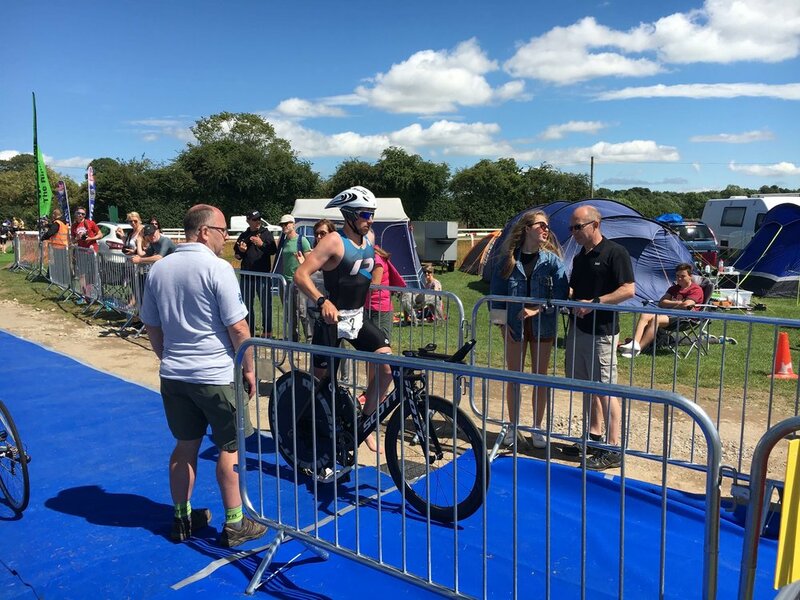 My bike time was 1hr 8m 14 secs and I knew I had put everything I could into this discipline (still 12mins down on the fastest bike time – amazes me how fast some people can go). T2 was super quick and I think there were only 20 who were quicker than me throughout the day. The first 500m of the run I could tell more effort had gone in on the bike leg and it took me a few minutes to feel like my run legs were with me. As mentioned it was hot so took sips of water on at most stations and threw the rest over my head. Unfortunately, I got a stitch about 2km in and had this all the way to the last 2km. I was really annoyed at the time because I felt all the other parts of the race had been quick (for me) and that a PB could have been on the cards. Sometimes the body just does not want to play ball so you have to re-evaluate and make decisions. I carried on running at a slower pace trying to minimalize the impact on the road on my left side. Eventually, I came home in 44mins 29sec my slowest 10k of the year. However, happy I ran (not walked) and got to the end - hot, sweaty and knackered. Total time of 2hr 20mins 10secs and on reflection after speaking to other athletes I think everyone found the run long. Even with a fit body I think the run would have been tough. Loved the race and the atmosphere…..now for the next one! Thanks to Rodger for supporting and coaching on the day and congratulations to Beau (fellow Racepace athlete and coach) who qualified for Rotterdam.